Today’s business climate is more turbulent than ever. With constant changes in regulations, interest rates, technology and competition, the need for farm and agribusiness decision makers to be able to anticipate risks and create multiple, flexible strategies is critical. Avoidance is the process of structuring the business so that certain types of risk are nonexistent. In swine production, risks associated with farrowing operations include disease, poor genetics, low conception rates and others. Traditional independent farrow-to-finish hog farmers could not avoid these risks, while farmers buying feeder pigs and finishing them out could. The problem for farmers buying feeder pigs in the past was that it was difficult to avoid the risks associated with buying pigs from various sources including variable quality, mixed genetics and disease. The movement to integrated production of swine has allowed growers to avoid these types of risks. Reduction is the process of lowering the risks associated with the business venture. A grain farmer can hire crop scouts to spot disease, fertility problems and pest control problems, thereby reducing (but not eliminating) the risk of poor yields. Another common way for farmers to reduce risk is to diversify across different enterprises. For example, some farm operations are diversified across crop and livestock enterprises as well. However, the value of reducing risk through diversification has to be balanced with the benefits of achieving economies of size that can accompany specialized production. Discontinue (or exit) particular business operations. Transition from the production of one specialty crop, such as non-GMO corn, to an alternative crop, such as high-oleic soybeans. Change the business arrangement. For instance, selling interest in the business or restructuring ownership arrangements can help shift some of the human risk related to injury, illness and death away from the key operator. As with any strategy, it is important to have a plan in place before disaster occurs. This includes techniques for how to exit or reposition an operation, knowing what events might initiate that decision, and either having strategic exit plans in writing or sharing them with others involved in the decision-making process so that a rational decision can be made if and when the time comes. Assumption/Retention is the process of retaining or accepting risks that would normally have been borne by some other party. The objective of assuming this increased risk is to maintain control or enhance overall profitability. Consider a livestock integrator who contracts with growers to finish hogs. The growers are usually responsible for providing the grow-out facilities for a fixed or minimum guaranteed fee. The integrator is retaining the risk of hog ownership with the expectation of enhanced profits. Transfers of risk occur when one party lowers their risk by shifting it to someone else, often for a specified price. Common examples of this type of shift include futures and options contracts and crop, fire and hail insurance. While the cost of this transfer is usually known or visible, sometimes the cost of the transfer is more disguised or vague. For example, grain farmers can transfer price risk through forward contracts. Adapted from: Baldwin, Ben G. (1989), The Complete Book of Insurance, Chicago, Illinois, Probus Publishing Company. While strategies for managing risk in agriculture are changing over time, it is generally true that farmers who operate under contract might have better opportunities for yield and price-risk avoidance, reduction and transfer than their traditional independent farmer counterparts. However, these opportunities might be offset by increases in less traditional risks, such as relationship and strategic risks. Integrators, on the other hand, have opportunities to assume more risk in today’s new, industrialized agricultural climate, and often do so with an expectation of higher returns. 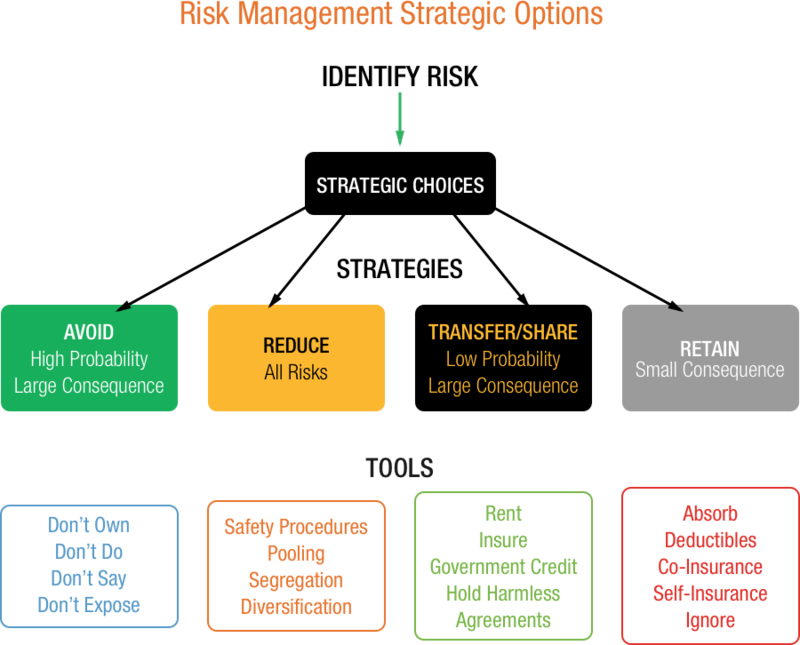 Adapted from Assessing Risk in Production Agriculture, Centrec Consulting Group, 2010.